CLEARFIELD – The Clearfield County Election Board will adhere to its interpretation of Bradford Township’s precinct boundaries as defined in a court order issued in 1985. The decision was made at a special meeting of the Election Board Tuesday morning. The board is comprised of the three county commissioners. The commissioners, in conjunction with Solicitor Kim Kesner and the Election Office, have been working to resolve precinct issues in advance of the upcoming Primary Election. The issues arose after the last presidential election when there were allegations of fraud across the country. State officials were mandated to ensure the validity of voter registrations. County officials maintain voter registration records and were in turn mandated to verify voters’ physical addresses and whether or not they were voting at the correct precinct. It was discovered then that some voters were possibly not voting in the correct precincts in Clearfield County, which resulted in a notice being mailed out. The commissioners previously directed the Election Office to halt mailing notices until a final decision was made. On Tuesday the staff was directed to resume mailings. Bradford Township Supervisor Ron Krise was present for the meeting and spoke during the public comment. He asked why the board was now adhering to an order from 1985. He said he’s personally received many complaints, and he was certain there were a lot of people who still haven’t received their notices. According to Krise, registered voters live near the municipal building and often walk over Election Day. Now, he said they will have to drive to Bigler. In addition, he said registered voters will be inconvenienced in Egypt because they will now be driving by the Woodland precinct to vote in Bigler. Krise asked why it was even necessary to have two precincts. Dawn Graham, election director, explained it was based upon population guidelines. More specifically, Graham said that a precinct must have no less than 100 registered voters and no more than 1,200 registered voters. During the last general election, she said Bigler and Woodland had 365 and 696 voters cast ballots, respectively. She said those figures are considerably lower during a municipal election. Krise said he was aware the Election Office was looking into alternative polling places for the Bigler precinct that offered more parking and better handicap accessibility. Ultimately, Krise said that the Election Board needed to review the precinct boundaries again and draw new lines. He said the current one wasn’t even remotely close to being in the middle. Resident Sam Lansberry asked how many registered voters were in each of the Bigler and Woodland precincts. Graham said as of October, there were 564 in Bigler and 1,164 in Woodland. Lansberry then asked what those figures would be under the proposal. He was advised it was unknown because the Election Office staff hasn’t completed the notification process. Lansberry said this was a big deal and they should have those numbers. He went on to say that the Election Board couldn’t reach a “reasonable decision” without knowing the balance. Commissioner Mark B. McCracken reiterated that the board wasn’t proposing any change and was required to adhere to the 1985 order unless it petitioned the court with a modification. 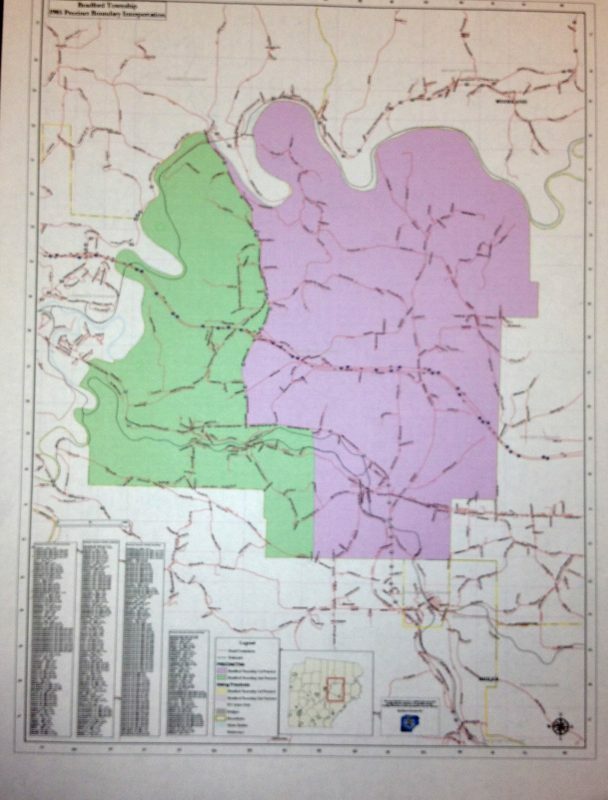 Based upon conversations with a former county commissioner, McCracken said it was learned that there were not any maps and the Bigler and Woodland precinct boundaries were put in writing. When the board was asked about its potential course of action, Kesner said the commissioners were hearing public comment and it would follow with deliberations and official action. He said the commissioners were not changing anything; this issue arose after being dormant for a number of years; and now it must be corrected. Kesner said it was a “complete misconstruction” to suggest the commissioners were changing precinct boundaries, which requires a petition to be filed with the court. He said the Election Office and the board were reacting to mandates from the state and federal governments to determine if people were voting in the correct precincts and found out they were not. “For so long, people have been voting where it’s been convenient for them,” Kesner said, adding, “that it’s no longer going to be tolerated. Scotto and McCracken asked if they had any authority to permit registered voters to cast ballots in precincts they aren’t currently residing in. Kesner said no and it would mean tolerating what’s incorrect and hoping there aren’t any challenges that could possibly put the county’s elections in any danger. He said voters shouldn’t allow any minor inconvenience, such as those expressed during the ongoing discussions of this precinct issue, keep them from exercising their right to vote. He also encouraged them to take their questions to the Department of State, which has made it clear the county is vulnerable to election challenges unless it makes these corrections. At the end of public comment, McCracken motioned to adhere with the 1985 order under the interpretation that it kept the Bigler and Woodland precincts intact with each consolidating with the Jackson precinct with Route 970 as the border. It was seconded by Scotto and approved by a unanimous 3-0 vote. Afterward Commissioner John A. Sobel, chair, said the board had to address similar issues in other precincts and it would be possible to reconvene on this matter.